Aortic Valve Bypass (AVB) surgery treats aortic stenosis with a valve-containing conduit that connects the apex of the left ventricle to the descending thoracic aorta. Clinical experience with AVB surgery in high-risk aortic stenosis (AS) patient has demonstrated effective and durable relief of left ventricular outflow tract obstruction. After AVB, blood is ejected from the left ventricle via both the native stenotic aortic valve and the conduit. 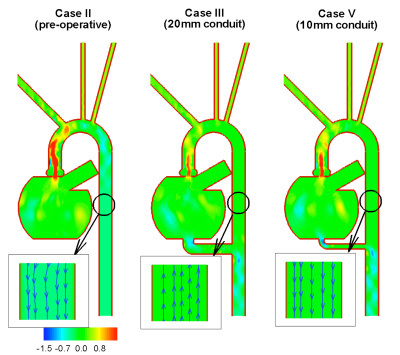 In this study we are performing computational modeling of the systemic circulation to determine the effects of AVB on aortic and cerebral blood flow, as well as the effect of conduit size on relative blood flow through the conduit and the native valve. The interaction of blood flow with the vascular boundary and heart valves is modeled using a hybrid Eurelian-Lagrangian formulation, where an unstructured Galerkin finite element method is coupled with an immersed boundary approach. Our results indicate that post-AVB cerebral blood flow is practically unchanged from normal and preoperative (AS) configurations, and was constant across all conduit sizes modeled. In the figure above a snapshot of the peak systolic flow in a simplified model of the heart and surrounding vessels is shown. Flow is visualized by isolines of the velocity component along the y-axis (axis aligned with descending aorta). The insert in each case shows streaklines indicating the flow direction. (The project is a collaboration between Dr. E. Balaras and Dr. G. Gammie at the University of Maryland Medical Center).